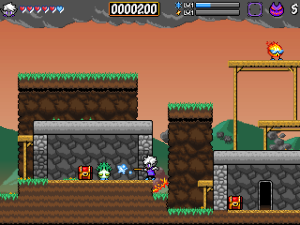 This will be a stage-based, procedurally-generated action platformer. Wait, don’t leave! Allow me to explain. I realize that some people like procedural generation, and others do not, and that crafting a platformer with procedurally-generated levels would potentially turn away those who are fond of platformers but who prefer static level design. Earlier in the year, I conducted a brief experiment, creating a rogue-lite platformer and taking peoples’ responses into consideration. I believe that I’ve conceptualized some better ideas for procedural generation as a result. Already, things are taking shape behind the scenes. The end result should look and feel organic, with stages that could contain up to three different environments. For example, you may start out in a town, ascend to some guard towers in the sky to unlock a gate, and then descend into some caverns to rescue a group of villagers. 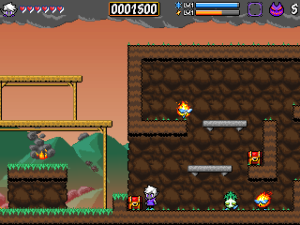 In another stage, you may need to climb trees and dive underwater to collect gems. All of this will be done to attempt to prevent the game from feeling repetitious and/or random, which is a common complaint I’ve fielded. For those who find procedurally-generated games unwelcoming: I want to make a game that will change your mind. This is a static stage, but it still shows off some procedural elements. The game will consist of multiple worlds, each containing six total stages: four normal, expansive stages spread across two environments and two boss stages. Different areas will have different goals, such as those mentioned in the previous paragraph. Special attention will be paid to boss fights. I love challenging, hectic boss battles that shake things up and make the player feel like they’ve actually accomplished something, so expect those to be presented as an integral part of the experience. 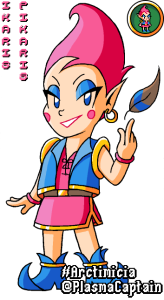 Those who listen to our podcast may recognize Arctimicia, the sorceress, and Sarabelle, the bard, as characters from the show. They will also be the protagonists of this game. No other characters from the podcast will be featured. 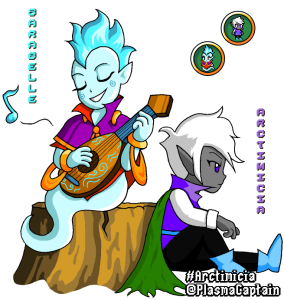 Sarabelle and Arctimicia, the protagonists. However, any connections with the podcast end there. This game will take place in its own completely separate reality. The versions of Arc and Sarabelle in this game’s reality are different iterations of the characters, with new backstories and roles to play. We started fresh from the ground-up, building another world with its own rules and history. I have been working together with FernGully to conceptualize the story, the environments, and the villains. This is like our team project. The game will follow Arc and Sarabelle as they travel through various lands distorted by a rampaging band of villains who strive to create chaos. If I had to compare the thematic quality of the piece to that of something more recognizable, I’d say it’s aesthetically similar to things like Bomberman or Mega Man or Sailor Moon, complete with a colourful cast of despicable themed bad guys with cartoonishly evil plans who are practically begging for an epic beatdown. Ikaris Pikaris, one of the new villains. 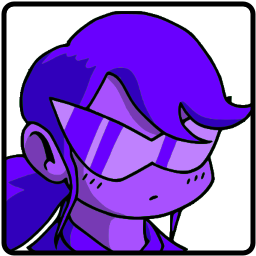 Arc will be the player character, while Sarabelle will take on a support role, offering information and occasional combat assistance. I hope you enjoy reading lots of silly dialogue in the face of overwhelming disaster, because that’s what’s going to happen. If not, don’t be deterred – I assure you that the game will be just as fun even if you skip through and ignore the story, just like its inspirational predecessors. Arc uses ice magick to trap and destroy monsters. Both types of magick are bound to individual experience bars, which can be upgraded by defeating enemies or opening some chests. Offering two methods of attack with unique effects opens up an array of possible interactions with enemies of various resistances and traps and puzzles. It will also make the boss battles rather interesting and diverse, as players will need to adjust their strategies in order to figure out how to take down each boss. I’d rather not spoil too much at this time, so that’s all I’m going to say about that for now. I have outlined a schedule and am attempting to stick to it as much as possible. It is my belief, based on experience, that I will be able to completely develop and reasonably test this game by the summer of 2016. However, in order to meet that date, your help may be requested! Please stay tuned. Your support and interest are much appreciated.